1. Today, for some people, words such as truth and reality have become impossible to utter unless they are set off by quotation marks, written out or mimed. This ritual gesture, common in American academic circles even before becoming a fairly standard practice, was meant to exorcise the specter of a thoughtless positivism: the attitude of those who hold that reality is knowable directly without intermediaries. Behind this often encountered polemic one usually comes across a skeptical position, variously argued. Moral, political, and intellectual objections have been formulated against it, even by me. But to simply keep ourselves virtuously aloof from the exaggerations of the positivists and the skeptics would serve no purpose. Walter Benjamin recalls a Brechtian maxim: "Don't start from the good old things but the bad new ones." Skeptics and deconstructionists almost always react to real questions in a dramatically inadequate way. Elsewhere I have argued against their responses, but here I would like to consider some of their basic assumptions. 2. A false statement, a true statement, and an invented statement do not present any differences among themselves, from a formal point of view. When Emile Benveniste studied the tenses of the French verb he did not hesitate to use examples taken from both romances and histories. In a short novel entitled Pontius Pilate Roger Caillois astutely explored the implications of this analogy. It is nighttime: the next morning Jesus will be tried. Pilate has not yet decided on the sentence. To persuade him to choose condemnation, someone predicts a long series of events that would follow the death of Jesus: some are important, others are insignificant-but, as the reader grasps, all are true. The next day Pilate decides to absolve the accused. The disciples repudiate Jesus; the history of the world takes a different path. The affinity between fiction and history brings to mind those paintings by Magritte which without a break portray a landscape and its reflection in a broken mirror. To say that a historical narrative resembles a fictional one is obvious enough. More interesting is to ask ourselves why we perceive as real the events recounted in a work of history. Usually it is a result produced by both textual and extratextual elements. I shall focus on the latter and attempt to show some procedures, associated with literary conventions, with which both ancient and modern historians have attempted to communicate that "effect of reality" which they considered an essential part of the task they had set for themselves. 3. We can begin with a fragment from the Universal History of Polybius (34: 4, 4), quoted by Strabo. To demonstrate Homer's truthfulness, Polybius writes: "The object of history is truth, as when in the catalogue of ships the poet describes the features of the several localities, calling one city 'rocky,' another 'frontier-placed,' another 'with wealth of doves,' or 'hard by the sea.' But the object of picturesque detail is vividness, as when he introduces men fighting; and that of mythological allusion is to give pleasure or rouse wonder." In opposing history to myth, Homer stands squarely on the side of history and of truth: the purpose (telos) to which his poetry tends is in fact "vividness" (enargeian). In some manuscripts we find energeian rather than enargeian, but the context makes us think that the second is the more convincing reading. A similar confusion occurs in the manuscript tradition of a passage of Aristotle's Rhetoric (1411 b, 33-34), echoed in much later texts and coming down to our own day. In actual fact, the two words have nothing in common: energeia signifies "act, activity, energy"; enargeia, "clarity, vividness." The importance of the first term in Aristotelian terminology, decisive for the European intellectual lexicon, explains why energeia has survived in so many languages: it suffices to think of "energia," "energy," "√©nergie," and so forth. Enargeia instead died out. But it is possible to reconstruct its meaning: more precisely, the constellation of meanings that revolve about it. In the Homeric poems, often seen as supreme examples of enargeia, the word does not appear. We find enarg√©s, associated with the "manifest presence" of the gods (Iliad, 20: 131; Odyssey, 16: 161), and a connected adjective, argos, which signifies "white, brilliant"-like a goose, like an ox-or "rapid." According to Pierre Chantraine, "we must suppose at its origin a notion that expresses both the blinding whiteness of lightning and velocity." Enarg√©s can be translated, depending on the context, as "clear" or "tangible." Like enargeia, it is a word that can be connected to a sphere of immediate experience, as another fragment from Polybius suggests (20: 12, 8): "To see an operation with one's eyes is not like merely hearing a description of it. It is, indeed, quite another thing; and the confidence which such vivid experience gives is always greatly advantageous ... ." This passage, as well as Homer's cited above, concerns historical knowledge. In both, enargeia is considered a guarantee of truth. The ancient historian had to communicate the truth regarding that of which he was speaking by using enargeia, to move and convince his readers: a technical term which, according to the author of the treatise On the Sublime (15: 2), marked the aim of the orators, which was different from that of the poets, who attempted to enthrall their public. The Latin rhetorical tradition repeatedly tried to find terms equivalent to enargeia. Quintilian (Institutio Oratoria, 4: 2, 63) proposed evidentia in narratione. "Palpability, as far as I understand the term, is no doubt a great virtue, when a truth requires not merely to be told, but to some extent obtruded, still it may be included under lucidity." In another passage (6: 2, 32), Quintilian noted that Cicero had used, as synonyms for enargeia, illustratio and evidentia, "illumination and actuality, which makes us seem not so much to narrate as to exhibit the actual scene, while our emotions will be no less actively stirred than if we were present at the actual occurrence." In effect, for Cicero, "inlustris ... oratio" indicated "the part of the speech that places, in a matter of speaking, the fact before the eyes." The anonymous author of the Rhetorica ad Herennium used similar words to define demonstratio: "It is ocular demonstration when an event is so described in words that the business seems to be enacted and the subject to pass vividly before our eyes." Demonstratio. The terminology corresponding to this word in the European languages-dimostrazione, demonstration, d√©monstration, and so forth-conceals under a Euclidean veil a rhetorical nucleus. Demonstratio designated the orator's gesture that indicated an invisible object, rendering it almost palpable-enarg√©s-to the listener, thanks to the almost magical power of the words themselves. Similarly, the historian succeeded in communicating to readers his own experience-direct, as a witness, or indirect-placing an invisible reality before their eyes. Enargeia was a means to communicate the autopsia-in other words, immediate vision-by virtue of style. 4. Even Demetrius, the author of the famous treatise On Style (long erroneously identified with Demetrius of Phalerum), dedicated a relatively long section to enargeia, describing it as a stylistic effect that ensues from a description which contains nothing superfluous. After citing a Homeric simile (Iliad, 21: 257), he observed: "We shall treat first of vividness, which arises from an exact narration overlooking no detail and cutting out nothing." Further on, however, we run into a broader definition, which identifies as examples of "vividness" even the cacophony and the onomatopoeic words used by Homer. We seem to have veered away from the discussion of historical method from which we began, but only apparently so. The definition of enargeia as an accumulation of particulars casts an unexpected light on the claim, recurring among Greek historians, that they have recorded every event, or at least all the significant ones. In a society in which archives were rare and oral culture still dominated, Homer offered historians a model that was both stylistic and cognitive. In chapter 1 of Mimesis, Erich Auerbach juxtaposed two different types of narration: Homer's analytical richness and the Bible's synthetic concision. The importance of the Homeric narrative style for the birth in Greece of a new way to represent the human body on the one hand, and of history as a literary genre on the other, has been underlined by E. H. Gombrich and Hermann Strasburger. The latter, one of the scholars who has most profitably discussed the theoretical implications of enargeia, has noted that the term assumed a more technical significance in the Hellenistic age, when historians such as Duris of Samos and his disciple Philarchus created a new type of historiography, inspired by the tragic poets and aspiring to mimetic effects. 5. Thus far we have portrayed enargeia as a notion bordering historiography and rhetoric, but painting needs to be added to this semantic sphere. Here is a metaphor taken from Plato's dialogue the Statesman: "And our discussion might be compared to a picture of some living being which had been fairly drawn in outline, but had not yet attained the life and clearness which is given by the blending of colours." These implications of enargeia emerge fully, at a distance of many centuries, in a passage from the Images of Philostratus the Younger, a famous collection of descriptions (ekphraseis) of artworks, presumably imaginary. We read the following passage in an account of a painting representing the shield of Pyrrhus, inspired by one of the shields of Achilles in the Iliad, the model for this literary genre: "And if you should also notice the herd of cattle which press forward to their pasture followed by the herdsmen, you might not, indeed, marvel at the colour, although the whole scene is made of gold and tin, but the fact that you can almost hear the cows lowing in the painting and that the river along the banks of which are the cows seems to be making a splashing sound,-is not that the height of vividness [enargeia]?" "Simonides, however, calls painting inarticulate poetry and poetry articulate painting: for the actions which painters portray as taking place at the moment literature narrates and records after they have taken place. Even though artists with colour and design, and writers with words and phrases, represent the same subjects, they differ in the material and the manner of their imitation; and yet the underlying end and aim of both is one and the same; the most effective historian is he who, by a vivid representation of emotions and characters, makes his narration like a painting. Assuredly Thucydides is always striving for this vividness in his writing, since it is his desire to make the reader a spectator, as it were, and to produce vividly in the minds of those who peruse his narrative the emotions of amazement and consternation which were experienced by those who beheld them." 6. Some of the leading authorities on Greek and Roman history have recognized in the ekphrasis, along with Plutarch, the purpose of historical narration. The ekphrasis, writes Hermann Strasburger, was a concept embracing an extensive sphere containing pathos-ridden battle scenes, the Athens plague about which Thucydides spoke, and geographic and ethnographic descriptions (ekphraseis tou topou). If enargeia was the purpose of the ekphrasis, truth was the result of enargeia. We can imagine a sequence of this type: historical narration-description-vividness-truth. The difference between our concept of history and that of the ancients could be summed up as follows: for the Greeks and Romans historical truth was based on evidentia (the Latin equivalent of enargeia proposed by Quintilian); for us, on evidence. This is not an oversimplification. In a passage of the Institutio Oratoria (4: 2, 64-65) Quintilian observed that there were those who protested against the use of evidentia in narratione: "Some, however, regard this quality as actually being injurious at times, on the ground that in certain cases it is desirable to obscure the truth. The contention is, however, absurd. For he who desires to obscure the situation, will state what is false in lieu of the truth, but must still strive to secure an appearance of palpability for the facts which he narrates." This fair-minded description of the comportment of lawyers could have been extended to historians, given the intimate relationship between history and rhetoric. The definitive criterion of truth did not correspond to the reactions of the public. And yet truth was considered above all a question of persuasion, linked only marginally to an objective weighing of the facts. 7. For historians who, from the sixteenth century on, considered themselves heirs of Herodotus, Thucydides, and Livy, this was an obvious conclusion. The breach emerged later. Only in the second half of the seventeenth century did one begin to analyze systematically the differences between primary and secondary sources. In his famous essay "Ancient History and the Antiquarians," Arnaldo Momigliano demonstrated that this decisive contribution to the historical method came from antiquarians who used nonliterary evidence to reconstruct facts connected to religion, to political or administrative institutions, to the economy-spheres not touched upon by historians tendentiously oriented toward political and military history and toward the present. In the face of the corrosive criticism, sometimes taken to paradoxical limits, which skeptics like La Mothe Le Vayer directed against Greek and Roman historians, antiquarians objected that medals, coins, statues, and inscriptions offered a mass of much more solid documentary material, and more reliable, as well, compared to literary sources polluted by errors, superstitions, or lies. Modern historical writing came into being from the convergence-actually realized for the first time in the work of Edward Gibbon-between two different intellectual traditions: Voltaire's type of histoire philosophique and antiquarian research. 8. But the trajectory vigorously argued by Momigliano should be moved up by a century. In the mid-sixteenth century both the crisis of the skeptics and its dissipation as a consequence of antiquarian labors were lucidly formulated by a philologist and antiquarian of exceptional qualities, Francesco Robortello of Udine. He is known today especially for a pioneering work on the emendation of ancient texts (1557), which has received the attention it deserves. The few solid pages written on Robortello's De historica facultate disputatio (1548) have instead met a different fate. Its success in the sixteenth century, exemplified by its posthumous inclusion in the first collection of writings on the historical method (Artis historicae penus, 1579), was often followed, in times closer to our own, by befuddled and superficial readings. Robortello was fully cognizant of the originality of these pages. He was little more than thirty years old, teaching at the University of Pisa and a friend of the great philologist Pier Vettori. In his usual aggressive tone, Robortello declared in his dedication to Lelio Torelli (the philologist and jurist who a few years later would publish for the first time the famous Florentine manuscript of the Pandects) that he had tried to accomplish something totally new: to bring to light the art and method hidden in historical writing. The purpose of the historian, Robortello begins, is narration, although immediately afterward he clarifies this: the historian is the one who "narrates and explains." This is followed by still another elucidation: the historian explains "the actions carried out by men themselves" (quas ipsi homines gerunt). The historian does not invent, but explains (non est effictor rerum, sed explanator). History is different from poetry, and, perhaps, in suggesting examples of what is just and unjust, it is superior to philosophy. The importance of this last statement emerges a few pages later when Robortello cites the critique, which he considered unpublished, attributed to Sextus Empiricus, "a Greek author who has expounded all the ideas of the Pyrrhonists." This is followed by a long quotation, translated into Latin but with a sprinkling of Greek words and phrases, from the treatise Adversus mathematicos (1: 252-260), a key and, in a sense, unique source on Greek skepticism. Robortello was justifiably proud to have drawn attention to the novelty of this quotation. At that particular moment Sextus Empiricus was still primarily just a name. He would make his grand entrance in European philosophy in 1562 when Henri Estienne translated his Outlines of Pyrrhonism into Latin. It has been said that before that, Sextus had only one modern reader, Gian Francesco Pico, author of an Examen vanitatis doctrinae gentium ("Examination of the Vacuity of Pagan Philosophy"), a harsh critique written in the name of the intransigent Christianity of Savonarola, of whom he was a follower. This vast work, based on the still-unpublished writings of Sextus, contained pages used by Robortello almost thirty years later. But Robortello may not have seen them: even if he had, in any case, he used the Greek text, probably MS. Laur. 85, 11, dated 1465, which includes two works by Sextus: the Outlines of Pyrhhonism and the Adversus mathematicos. The second part of the latter work deals with the grammarians, some of whom-the celebrated Dionysius, surnamed Thrax, among them-had maintained that grammar has a historical component. Sextus Empiricus objected that history lacks method: it is not a techn√© (in Latin, ars) but a simple accumulation of facts, irrelevant, doubtful, or mythical. Against this, Robortello attempted to demonstrate the existence of an ars historica: a polemical expression which inspired the title of an anthology such as the Artis historicae penus, conceived as a response, though too polemical, to the spread of skepticism about historiography. Robortello begins his argument by affirming that the methodological element in history is identifiable with rhetoric. In fact, he concedes, the ancients, as Cicero reminds us (De oratore 2), wrote annals totally lacking in method, free of rhetorical preoccupations. But if we invent (effingantur) speeches and actions that are probable and appropriate, as Thucydides did, we can see clearly that rhetoric is the mother of history. Robortello's position has been identified with this response, which in itself had nothing especially original about it. It has not been noted that the insistence on the capacity to invent (effingere) speeches contradicted the previous statement about the historian who does not invent but, rather, explains (non est effictor rerum, sed explanator). Above all, it has not been noticed that immediately thereafter, Robortello takes a different approach. The historian deals with actions, both public and private: and thus necessarily with the names of the persons involved in them. This, Robortello states, is the particular element ("what Alcibiades did or experienced") which Aristotle had identified in history, setting it against the universality of poetry. Behind this statement are Robortello's labors on two books appearing that very year-1548: the commentary to the Poetics of Aristotle, and an erudite piece, De nominibus Romanorum (On Roman Names). The name, that datum which is the backbone of the annalistic genre, brings along with it a reflection on the nature of historical narration. In the praise which Aristotle lavishes on Homer for having initiated his narrations in the middle of things (in media res), Robortello reads an implicit invitation to historians to follow, instead, a chronological sequence, to recount "a long series of years." Even if, Robortello muses, the hypothesis of a new cyclical beginning suggested by certain philosophers was true, historians must resolve to recount history commencing with those crude, rough beginnings of the human species that have been described by the poets: "But if the historian has to dedicate himself to this long progression of years, clearly his competence must embrace all of antiquity: all that which concerns customs, the means of supporting oneself, the foundation of cities, the migrations of people." Let Thucydides set an example for us, who in the sixth book explains in a detailed and truthful manner the antiquity of the cities and peoples in all of Sicily. And since to know these antiquities the remains of old buildings, the inscriptions cut into marble, gold, bronze, and silver are extremely useful, he must take these into account. And once again Thucydides (is there perchance need to seek out any other authority than that of such an illustrious historian?) establishes [probat], on the basis of an inscription cut into a marble in the Acropolis as a warning to posterity, something that many had forgotten: Hippias the Athenian was a tyrant, and had fathered five sons. With a sure eye Robortello had selected a page in Thucydides (6: 54-55) which made his case: an argument which transformed a fragment of an inscription into evidence. He had accepted an invitation to broaden the framework of the research. Since history is a component of rhetoric, it has to embrace everything that rhetoric encompasses: political systems, the election of magistrates, the operation of courts, the military art. History must describe "rivers, lakes, swamps, mountains, plains, the sites of cities"-an allusion to Lucian, who is specifically mentioned at the end of the piece: "The best author of history must possess two things principally: political intelligence and expressive ability." These were not abstract admonitions on Robortello's part. (During his activity as antiquarian and philologist he emended a series of passages in Livy on the basis of inscriptions-a chapter in his long, corrosive controversy with Carlo Sigonio.) Instead, he quietly dropped the grandiose project, outlined in the Disputatio, to combine political history and antiquarianism. 9. Robortello's writings teemed with ideas and contradictions. He defended history from the accusation made by Sextus Empiricus that it lacked method because of its relationship to rhetoric: but what Robortello meant by the term rhetoric was not clear. Earlier he had identified it with fictional speeches in Thucydides, later with the interpretation-it, too, using Thucydides as an example-of nonliterary evidence from an antiquarian perspective. These two meanings for rhetoric were not necessarily incompatible: in Aristotle's Rhetoric evidence had great importance. But Robortello seemed to hesitate on this point. After having rejected annals, following Cicero, for their stylistic crudeness, Robortello resurrected them under the table as the chronological framework for antiquarian history which had its origins in the distant past. This rehabilitation of annals, cautiously proposed, found an unforeseen opportunity for development in the Paduan environment, already the scene of the Robortello-Sigonio controversy. According to a traditional definition, annals were a sort of intermediate genre between history and antiquarianism. The grammarian Verrius Flaccus, quoted by Aulus Gellius (Noctes Atticae, 5: 18), affirmed: "Some think that history differs from annals in this particular, that while each is a narrative of events, yet history is properly an account of events in which the narrator took part." This distinction (about which Flaccus actually nurtured some doubts) was resurrected some centuries later in the great encyclopedic work by Isidore of Seville (Etymologiae, I, 44): "The difference between history and annals resides in the fact that history concerns periods which we have been able to see, while annals deal with years which our age has not known." Naturally history was considered a much more complex genre than annals. As Gellius wrote, resting on the authority of Sempronius Asellio, history revealed not only what had taken place but also with what intention and for what reason [quo consilio quaque ratione] it had taken place. These definitions must be kept in mind when weighing the controversial implications of the thesis advanced by Sperone Speroni (1500-1588) in his unfinished Dialogo della Istoria, a writing on which he was hard at work up to the time of his death. The dialogue, in two parts, consists of a discussion, which is imagined to have taken place in Rome among the scholar Paolo Manuzio, son of the famous Venetian printer Aldus; Silvio Antoniano, secretary of the College of Cardinals from 1568; and the Paduan philosopher Girolamo Zabarella. In the first part Zabarella describes an unpublished "booklet" by Pietro Pomponazzi on history. (No copies of it are known today.) It was not "a complete and separate work, as are others published by the same author, but rather a commentary." Pomponazzi had given the "booklet" to be copied to one of his students, who at the time was twenty-one or twenty-two years old. The latter, still living in Padua, "now more than eighty-six years of age," had given his own copy to Zabarella. The student, naturally, was Speroni himself, and Pomponazzi's "booklet" would have been written in 1520 or 1521. The thesis of Peretto, as Pomponazzi was familiarly called, was simple. Repudiating the contemptuous view that went back to Cicero, Peretto argued that annals, although crude stylistically, were of greater value than history, being the very foundation of it. In the penultimate draft of part 1 of the Dialogo della Istoria, Speroni gave ample attention, using Zabarella's own words, to his old teacher's reasoning. Although "annals can be found in the world only in pieces, like the statues of citizens, and the arches and temples of the city," Zabarella observed, " [i]f you know them well and reason about them so as to be able to teach them, it would appear as if nothing has been lost." The tales narrated in annals "are in the judgment of my booklet the most faithful, and most useful and most honored ... that the human hand can record. I say the hand, and not industriousness, or intelligence, to indicate how simple and pure and clear and open their facts are, that it is almost as if first they were written, before being uttered or thought about." Simple, pure, clear, open: through Zabarella, his spokesman, Speroni expressed unqualified hostility toward rhetoric and its flourishes. In another writing, the Dialogo secondo Virgilio , Speroni attributed similar dissatisfaction to the Aristotelian philosopher Pietro Trapolino (Trapolin). After saying that "the Aeneid by its very nature is history, but has much that is poetry about it," Trapolin further clarified that "the Decades of Livy are certainly history in spite of the many orations they contain to puff them up, which smack too much of rhetoric and its causes." In this dig against the city's glory by the Paduan Speroni, using the words of his fellow citizen Trapolino, teacher and later colleague of Pomponazzi, the thesis of the superiority of annals expounded in the latter's "booklet" is once again visible. But other passages in Speroni reveal a more conciliatory attitude. In the Dialogo della Istoria, Silvio Antoniano intervenes in the discussion on the correctness of including fictitious speech in a work of history, and proposes a compromise solution. We need to allow the good historian "for the pleasure of the reader, to embellish the truth, just as in the construction of palaces the marble is decorated with carvings and the interiors with paintings; and these two exertions are not the work of the builder, but of the painter and the sculptor." Fictitious speech in the mouths of the leaders of armies or of conspiracies is acceptable as ornamentation, but on one condition: that it be indicated as direct discourse. If, instead, the historian "offers it in his own name with a roundabout narration, it makes it seem that he is affirming as something he experienced, as if it were part of history, what he does not know, not having been present, and those who had been present having had something else to do other than string together words, in order to attribute them to the writer." When Speroni was comparing the speeches of historians to the paintings which adorned palaces, he may have been thinking of the frescoes executed twenty years earlier by Paolo Veronese for the Villa Barbaro built at Maser by Andrea Palladio. Gazing upon the images created by Veronese, which for an instant deceive the spectator's eye with their splendid, subtle clarity, Speroni might have evoked the enargeia, the vividness of ancient rhetoric (figure 1). But where historical works were concerned, Speroni's patience with ornamentation had definite limits. A lasting deception, an indirect speech passed off as authentic, would have violated the responsibility of the historian toward truth. These rigid views corresponded to some broached by Pomponazzi in his memorable discussion with the Greek humanist Janus Lascaris, which we can read in another of Speroni's writings, Dialogo delle lingue. This was noted by Paolo Manuzio, one of the interlocutors in the Dialogo della Istoria: "Peretto was very fond ... of the truth simply presented, without concern for the latinity of the language: and therefore he always read the text of his Aristotle in ancient translations, paying little notice to the elegant versions of the teachers of the two languages, who imitated Cicero; and thus this may be how his apparent affection for annals came about ... ."
And, turning to Zabarella, he concluded: "Subtly you compare the truth of the annals to the premises of syllogism and to the principles of the sciences, and to the truth of particular histories, which are dependent on annals, to syllogistic conclusions ... ."
The provocative originality of the glorification of annals as the kernel of historiography was grasped by Alvise Mocenigo, Speroni's intimate friend who was copying the penultimate version of the Dialogo della Istoria. "I am fully aware," Mocenigo commented, "that the history which serves all functions is none other than the annal; that the others are for the glory of their writers for the use of their readers; and without them we would proceed quite blindly in our deliberations, because through them, as in other things, the best principle comes from experience, which is founded on the annal, which treasures its memory, and serves as guide for the consideration of the future." In an ambience which had experienced Robortello's teaching and writings, Pomponazzi's ideas on history were accepted with less difficulty. Only the discovery of the lost "booklet" would permit us to reintroduce those ideas in their original context. But why did Speroni resurrect them almost seventy years later? The answer probably lies in the presence among the interlocutors of the Dialogo della Istoria of Silvio Antoniano, from 1568 secretary of the College of Cardinals and vice-rector of the University of Rome, "La Sapienza." In the moment when the aged Speroni was proclaiming, through Pomponazzi's "booklet," the superiority of annals over histories, Antoniano was receiving from Caesar Baronius the text of the first volume of the just-completed Annales Ecclesiastici so that he could give his approval before its publication (1588). It could not have been by chance. Speroni was rehabilitating the themes and the terms of the old battle fought by Pomponazzi for the truth of things against verbal embellishment, and he was restating them in a completely different context, putting them in the service of the Ecclesiastical Annals, that great and learned anti-Protestant undertaking, conceived in the circles of the Oratory of San Filippo Neri, with which both Baronius and Antoniano were in close contact. 10. Annals and history, as we have seen, were traditionally looked upon as very different literary genres. The former, oriented toward the reconstruction of remote events, were considered more closely related to erudition than to rhetoric. Initially, Baronius had conceived writing a Historia ecclesiastica controversa: a title that presumably presupposed a very different type of work than what was eventually produced. The decision to orient himself toward the annal was certainly dictated by the desire to counter with facts the Protestant historiography of the Centuriators of Magdeburg. But this choice was then justified on religious, not just controversialist, grounds. In the general introduction to the first tome of the Annales Ecclesiastici, published in 1588, Baronius declared that he had wanted to avoid the pagan custom (actually not just pagan) of introducing long fictional passages, intertwined with rhetorical flourishes. Rather, he had preferred to obey Christ's injunction: "Let what you say be simply 'yes' or 'no'; anything more than this comes from evil" (Matt. 5:37). Tension between religion and rhetoric, and attempts to bridge it, have occurred frequently in Christian history. Think, for example, of the famous letter in which St. Jerome tells of having dreamed of Jesus in the guise of a judge condemning him to be flogged, reproaching him for being more Ciceronian than Christian. In the case of Baronius, the exclusion of fictional speech, imposed by the genre of annals, was in accord with antirhetorical views based on lean, unadorned discourse inspired (or at least looked upon with favor) by St. Philip Neri, the founder of the Congregation of the Oratory. The search for truth, to Baronius, seemed incompatible with polished and stylistically homogeneous speech. He used to say that he avoided commentaries as much as possible, relying on the words he found in the sources themselves, even if rough and inelegant, "quamvis horridula et incomposita." The brusque stylistic dissonance created by the insertion of terms taken from documents dating to late antiquity or the Middle Ages was emphasized typographically by the notes. What he had written, Baronius declared, was based not on the chatter of the ignorant (indoctas fabulas), but on the most reliable witnesses, easily recognizable in the margins of his pages, without having to look up a long list of authors. 11. The marginal notes, referenced in the text of the Annales Ecclesiastici by a lowercase letter, indicate the beginning of the citation, introduced by verbs such as inquit, ait, tradit, dicit, scribit, and so forth. The end of the citation is generally marked by a square parenthesis (]). The use of typographical marks in the left-hand margin of the page (") to indicate quotations had been in use for more than half a century. The employment of marginal notes is supposed to have come later. Citations, as well as notes and the linguistic-typographical marks that accompany them, can be considered as equivalents of enargeia since they are procedures intended to communicate an effect of authenticity. Naturally, these were conventional signs: for Sperone Speroni, we recall, direct discourse (presumably preceded by quotation marks) announced fictional speech. But the similarity of the functions highlights the difference among the tools. Enargeia was connected to a culture based on oral communication and hand gestures; the marginal citations, the cross-references to the text, and the bracketed parentheses, to a culture dominated by printing. Enargeia attempted to communicate the illusion of the proximity of the past; the citations emphasized that the past is approachable only in an indirect, mediated manner. 12. In 1636 a treatise entitled Dell'arte historica appeared in Rome. Its author, the Jesuit Agostino Mascardi, argued, against Speroni, that the search for causes pertained to philosophers, not historians. Mascardi's approach was primarily rhetorical and stylistic. Astutely he analyzed the stylistic processes that had been used by both ancient and modern historians, among which was enargeia, which he italianized as enargia, and distinct from energeia, thereby disagreeing with Julius Caesar Scaliger. This attention to the language of historians was accompanied by a lack of interest in the sources, with a notable exception. Mascardi noted that ancient Greece was without "the archives which right up to today we find among us and that in every nation are considered venerable and sacrosanct for preserving writings, especially public documents." But historians should not deceive themselves, even where archives exist: "Princes conduct ... their affairs with such great secrecy that to penetrate their inner workings is of greater difficulty than even to decipher the riddle of the Sphinx." In some rather lively writing, Mascardi, author of a work on the conspiracy of Gianluigi Fieschi, observed that the doings of sovereigns leave either no trace or distorted and misleading ones in the reports of their ambassadors. For Mascardi history was essentially political history. He utters nary a word about Baronius's Annales Ecclesiastici, a European best seller which had become the target of ferocious attacks. About antiquarian research, Mascardi spoke with obvious complacency in a passage that alluded, without naming it, to the Museo cartaceo of Cassiano dal Pozzo: "The relics of the arches of Constantine and Septimius in Rome, the last relics of the voracity of time and the pride of the barbarians, the two columns of Trajan and Antoninus, entirely figured in bas-relief, contain records that are so beautiful, that antiquarians have copied many things from them, to enrich their very learned books: many military costumes, many weapons of war, many adornments of triumphs, and much else have been taken from these books of marble and transferred to paper books to teach us all. But I have not proposed memorials of this kind as subjects for the art of history which I am writing." 13. That which Mascardi's "art of history" had ignored exacted its revenge. Thanks especially to ecclesiastical history and to antiquarianism, "evidence" won out over enargeia (evidentia in narratione). Even if they are not at all incompatible, no historian today can imagine using the latter as a surrogate for the former. But a subtle devaluation of historiography as a consequence of antiquarianism had begun earlier, as demonstrated by a celebrated writing of Manuel Chrysoloras, the learned Greek who moved to Italy c. 1395. In 1411, after having traveled to Rome, he wrote a long letter to Manuel Paleologus, the Byzantine emperor, in which he contrasted Rome, first pagan and then Christian, with the new Rome, Constantinople. Of ancient Rome, Chrysoloras described the majestic ruins, including "the trophies and arches, built to recall the triumphs with their solemn processions, sculpted with the very images of war, of the prisoners, of the booty, of the sieges." And it is still possible to see in them the sacrificial victims, the altars, the votive gifts, the naval battles, the clashes between infantry and cavalry and we can say every type of battle, of war machines and arms, and the vanquished rulers whether Medes or Persians, Iberians or Celts or Assyrians, all in their proper vestments, the enslaved populace, the generals who celebrate their triumphs over them ... And it is possible to know all this from how they are represented, as if they dealt with a living reality, so that every single detail becomes perfectly comprehensible thanks to the inscriptions that are engraved there, to the point that we can see clearly what arms and what vestments were in use in ancient times, what distinctive signs identified the offices, how their formations were drawn up, the battles ... .
it is thought that Herodotus and other writers of history have done us a great service when they describe these things. But in these works it is possible to see everything, just as if we were really living in those times and among those people, so that they form a history that defines everything simply. In fact, it is not a historical work [historian] but I would prefer to say almost the direct vision [autopsian] and manifestation [parousian] of everything that existed anywhere at that time. From the written word to the immediate evocation which brings forth life itself: the sequence ekphrasis-autopsia-parousia underlined the enargeia of Chrysoloras's epistle. Much more unusual was the juxtaposition between Herodotus and the statuary of the Arch of Constantine, followed by the recognition of the superiority of the latter over the former. The ekphrasis, so frequently used as a tool in the service of historiography, in the present case affirmed what historians had ignored or treated inadequately. But in Chrysoloras's letter the evocation that almost brought the past into the present was followed by the recognition of the inescapable transience of pagan authority. Conquerors and vanquished experienced the same fate; "everything is reduced to dust." The subject was not new; what was new was the distrust in the possibility of being able, with the help of rhetoric, to evoke the past as an accomplished fact. Its place was taken by an awareness that our understanding of the past inevitably was uncertain, discontinuous, lacunar, based only on fragments and ruins. 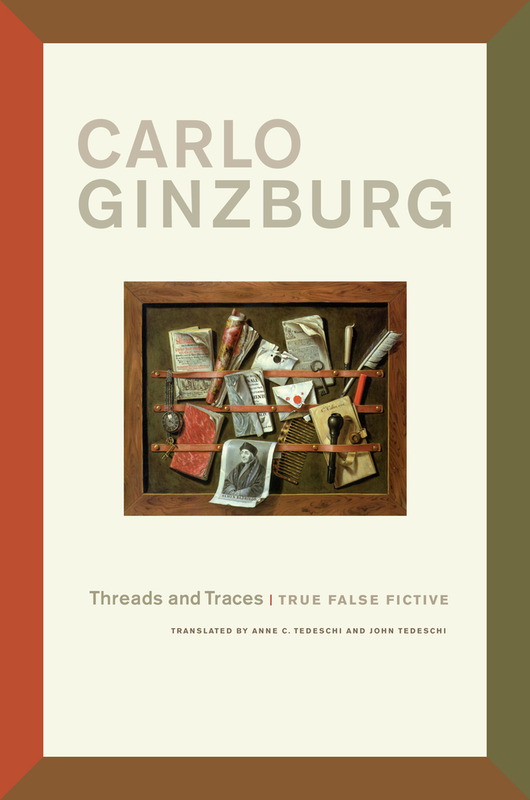 Carlo Ginzburg is retired from Scuola Normale Superiore, Pisa (Italy). He is the author of numerous books that have been translated into English including The Cheese and the Worms: The Cosmos of a Sixteenth-Century Miller.